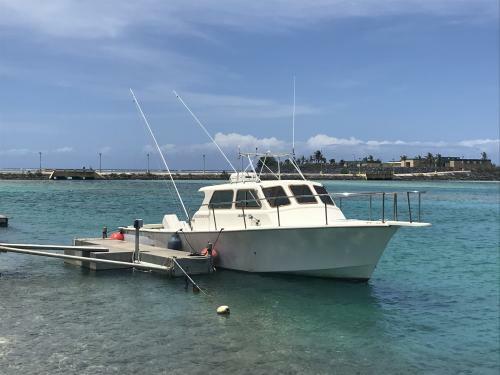 Heritage Boat Charters is run and operated by Captain Carlos Quinata. He was born and raised in the southern part of Guam, exploring the waters since he was a young boy. He was introduced to fishing by his father, who showed him all the wonders the waters have to offer. Naturally, Carlos took to the ocean. The rest is history. There was a slight miscommunication on the time but fortunately I had a contact for one of the guys. He was very helpful and after that there were no problems. The boats isn’t “fancy” and they don’t provide food or anything. You’re really there to just fish. When we can back the captain helped us take pictures and then got to filleting the fish right away. He was very skilled and left no room for doubt. We plan on going again in January. Captain was not talkative or informative, and kind of clueless. Nice guy, but didn’t engage us or explain anything about the fishing, location, plan, safety, etc; or acknowledge that multiple passengers were visibly sick in rough seas. Had to request to come home early by two hours. Pay $25 more and go with another charter.